Apple sold the most premium ($400 and up) smartphones in 2018 according to new Counterpoint Research data. A new entrant – OnePlus cracked the prestigious rankings for the first time in its brief history. 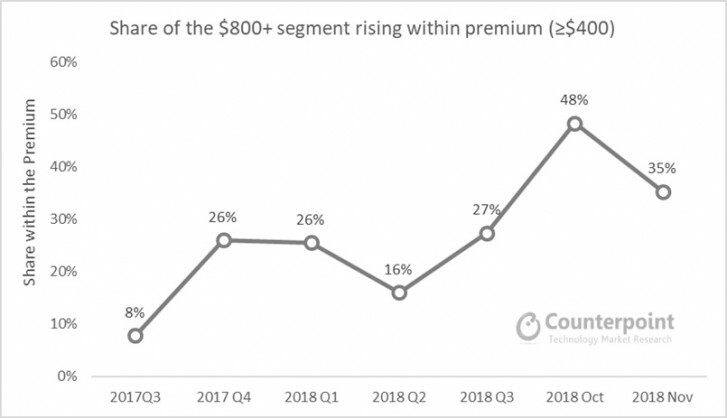 Overall, the premium segment grew by 14% year on year, despite the slumping global smartphone market which saw a 3% decline. Chinese OEMs Huawei, Oppo, and OnePlus have all expanded their presence, as established players Samsung and Apple lost some share. Apple still dominates with its 51% share, followed by Samsung with 22% and Huawei with 10%. Thanks to strong sales of its P20 and Mate 20 series, the Chinese manufacturer saw a 97% year on year growth. OnePlus was the fastest gainer in the $400-$600 segment thanks in large part to record-setting sales in India. The ultra-premium ($800 and up) was the fastest growing segment and it’s the one where Apple’s dominance is most pronounced – it accounts for nearly 80% of the phones sold. The report says that buyers are content with paying more for devices as long as they will be able to use them over a longer time period. Researchers expect the premium segment to grow thanks in large to 5G and foldable devices.